No one had ever brought sight to someone born blind so naturally Pharisaic tradition held that only the Messiah could do such a thing. What would they have given to have the know how to do so like today? John 9:1-41, tells how one Sabbath day while at the Temple Jesus and his disciples encountered just such a person. Imagine being born with no sight, never seeing a rainbow, or color of any kind. Imagine never seeing the stars at night, the face of a friend, or even the face of your own parents! 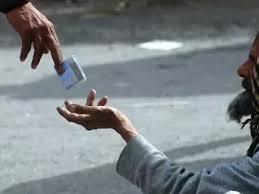 In that time and place the only lot in life for the blind was sitting somewhere in the Temple area with a cup in one hand reaching out and crying “Alms for the blind?” to the people walking by! The poor like that were considered cursed by God. Imagine the feeling of alienation with people all around you but you might as well be on another planet from the way they ignored you? Now, when his disciples saw this man they asked Jesus “Rabbi, who sinned, this man or his parents, that he would be born blind?” They too felt no instant compassion for him but then why not. Some Jewish traditions held that children were born with handicaps because their parents sinned. Well, tradition can be wrong. For instance if all the sins of our parents were passed down to us then we’d all be in worse condition than this blind man! We’d all die very young in life if the sins of our parents, grand parents were passed down to us! In fairness some types of sins do have a direct correlation with an affliction that latter affect ourselves and others. In John 5:14, Jesus healed a lame man and told him “See you have been made well. Sin no more, lest a worse thing come upon you.” Sometimes our sin can affect our children. For instance the pregnant mother that habitually uses crack cocaine or alcohol has a high chance her child will be born an addict too. God also sometimes chastens us for his ultimate purposes. Remember Job, a righteous man who had everything but God let Satan turn his life upside down for a while? But in the 1st Century Israel they had their own beliefs about sins and handicaps like the following two. One Rabbi of the time said unborn children could sin while inside the womb. He based this on the Genesis account of Jacob and Esau, the twins born to Isaac and Rebekah. His theory said since they struggled with each other while in the womb God eventually blessed Jacob and not Esau. Another belief said a child’s soul could sin before it entered the womb. It went like this: There is a pre-existing repository of unborn human souls somewhere and when a baby was conceived God would grab one of these souls and place it into the new babies body. Occasionally one of these souls had sinned before God picked it out and it justifiably was punished with a handicap at birth! But the bible doesn’t teach of some warehouse in the sky where souls are kept until they’re needed. Modern pediatrics teaches that babies move around naturally in the womb while developing so we can discount both of these theories. But one of these explanations may have driven the attitude of the disciples towards this blind man. Another explanation is reincarnation. You’ve probably heard about bad karma; how in a previous life if you did bad things you suffered for it in your next life. Well, the bible definitely doesn’t teach reincarnation so that explanation is out entirely. So what does the bible teach when it comes to sin and afflictions? Well, it teaches that all mankind is conceived and born with the DNA of sin, that none of us are worthy of redemption. It teaches that we don’t necessarily suffer from the sins of our parents but from the general sinfulness of the world and sometimes the product of sin is handicapped people but since God is sovereign over everything he uses it for his glory. So perhaps that’s why Jesus answered the disciples question: “It was neither that this man sinned, nor his parents; but it was so that the works of God might be displayed in him” which must have caused a bewildered reaction from the twelve. Naturally we ask “Why does God allow suffering? Why doesn’t he put an end to all of the suffering in the world? Wouldn’t a loving god do that?” The answer is God allows suffering so he can do something about it at just the right time. Well when is this “just the right time”? Easy, he let his son die on the cross and he urges us to accept him as our personal savior because in return when we die we’ll receive glorified bodies. Yes, when a child of God dies he receives his old body but its new again, in its prime with no disease, no affliction, no handicap, no pain. Look for signs of some old injury you had, maybe scar from an injury or operation, or a birth mark and you won’t find it. A long lost limb will be replaced. Look for gray hair and you won’t find a one. Darkness was coming fast so Jesus quickly knelt down and grabbed up a bit of dirt, enough to fill the palm of his hand. He spat in it and mixed his saliva with the dirt creating a mud slurry. 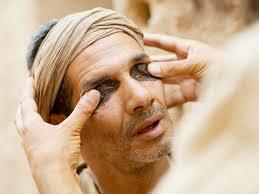 Then he smeared both of the man’s eyes with it and told him to go to the pool at Siloam to wash his eyes. The man did as he was instructed. When he did he could see for the first time in his life. Now, you might ask why did Jesus use spit and dirt to give the man sight? He could have cured him a multitude of different ways like he had in other occasions. One deaf man could hear after Jesus put a finger in each of his ears. Remember the Centurion’s servant? He was miles away when Jesus healed him. I think Christ was driving home the point that it was neither a potion of mud, or a physical touch but his power alone that brought healing! Well, the man did as he was told and he could now see. Imagine his astonishment when he saw for the first time a blue sky, his own hands, a friends face! People he frequented at the pool, even where he lived didn’t recognize him. They were asking, “Is not this the one who used to sit and beg?” This may be because the eyes are one of the predominate characteristics we identify people with. We tend to center on them to recognize others. Is there a lesson here? We’re born spiritually blind in this world. We can’t cure ourselves of it no matter how many Ph.D.s we have. Those of us who follow Jesus’ directives no matter what “the world” says or thinks of it are made to see. We don’t deserve it but Christ is always ready to heal us just like he didn’t have to be asked to cure that blind man. Have you been healed spiritually like this man was healed physically? It was a joyous scene to witness but then the Pharisees began their scrutiny of it…..